There is a growing need for consistent measurement of enterprise resource planning (SAP, Siebel, and PeopleSoft) platforms, to eliminate costly customization errors or failures. Analyzing the system architecture and custom code providing architectural blueprints and the identification performance and stability vulnerabilities in critical. ERP implementations with a lot of custom code or integrations with web and legacy components are notorious for performance and stability issues. CAST gives IT organizations and systems integrators a detailed, practical road map for sequencing their development, maintenance, and upgrade tasks. Why is CAST AIP Unique? CAST analyzes all SAP-related technologies within the system such as SQL calls to an Oracle RDBMS which often critical to the performance and stability of ERP systems in the production environment. CAST measures the product itself, not the process by which it is customized. Specifically, we accurately quantify the quality and size of customization done by internal or outsourced teams. CAST vulnerabilities that cannot be detected in functional and non-functional testing. These are problems that have to do with the structural quality – the way in which the system is architecturally put together. 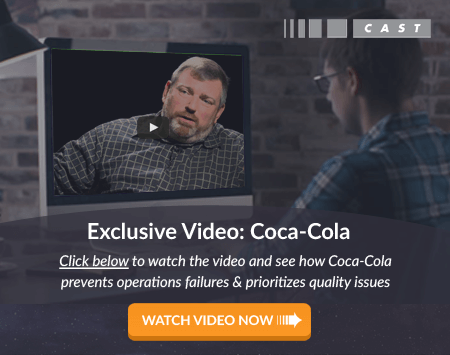 Michael Furniss, Director of CoE at Coca-Cola Bottling Investment Group, discusses how CAST helps him control the quality of SAP customization to ensure business continuity.